Stresa, next to Lake Maggiore and opposite the pretty Borromeo Islands, is full of handsome hotels. And these handsome hotels contain some good-looking restaurants. Two of the best are within the Villa Aminta and the Regina Palace. 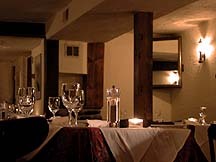 If you like the fantastical, you will lose your heart immediately to the Ristorante I Mori at the Hotel Villa Aminta. Its decoration is deliciously over-the-top: a stunning confection – at once both immaculate and riotous – of black and white, silver and gold, pink and red. This is a place for those who enjoy the plush delights of the jewel box. Although I was visiting only for dinner, the very smart General Manager (Roberto Zanetta) gave me a brief tour of the property – and I can report that every corner of the Villa Aminta twinkles with decorative delights. I sat in a gilt fauteuil, upholstered in heavy red and gold brocade, at a table with a pink tablecloth and listened to the pianist’s rendition of ‘My Way’. Framing the entrance were fluted pilasters with Ionic capitals. Above, the ceiling was black. From it came down a giant chandelier of multi-coloured Murano crystal. Below, the floor was a black and white mosaic. 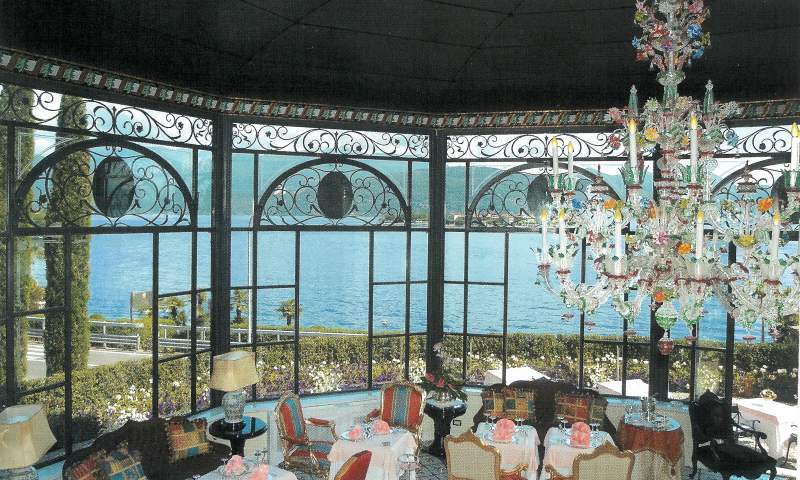 Through the plate glass walls of this elegant and intimate gazebo I could see across the lake to the Isola Bella. I predicted that in such surroundings I was going to enjoy my food. As you would expect in these surroundings, service is formal and proper. And friendly. There was many a smile from my efficient waiter, Davide Pellecchia – who looked very smart in his white jacket, with its black and gold epaulettes. Assistant maitre d’ Marco Zocchetti took care of my wine. The wine list is not long, but there are some attractive prices. (2000 Tignanello at 66 euros; 1999 Ornellaia 128 euros.) 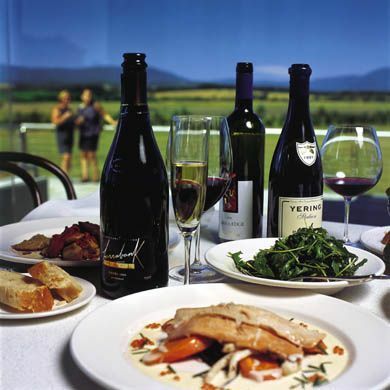 My white was a chardonnay from the Friuli region, bright and woody (Vinnaiola Jermann, 2002 – 27 euros). And my red was a Piedmontese star. This barolo needed its decanting, but then it flowered, yielding a nose of candied black cherries, lots of ripe fruit in the mouth and a lingering aftertaste of sweet harmonies (Falletto, Bruno Giacosa, 2000 – 104 euros). I thank Signor Zocchetti for bringing such pleasure to my table. And I thank the Ristorante I Mori for a thoroughly pleasurable evening. The Villa Aminta is slightly out of town. 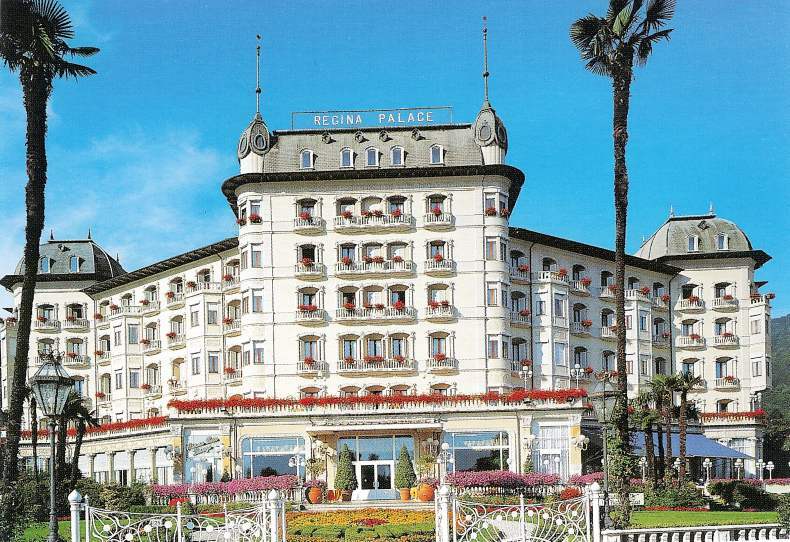 Right in the centre of Stresa’s promenade is the vast Belle Epoque pile which is the Regina Palace Hotel. I walked into its monumental entrance hall and was reminded, such is its scale, of the grandeur of our great railway stations. And through a door on the right is the Ristorante Charleston. I was greeted by the pleasant maitre d’, Silvio Cane, who took me out – the evening being mild – onto the restaurant’s small terrace. This was a charming spot – next to the hotel gardens, with their palm trees and birdsong. Settled on the orange cushions of an armchair in black wrought iron, and with a white tablecloth before me, I surveyed the menu. Traditional food, straightforwardly prepared. Thus the menu and thus the dishes which were brought to my table under silver domes by the waiter in black tie, Michele. Easily the best of my four courses was the ravioli de plin – small ravioli, filled with Raschiera cheese and brown butter. This was lovely, soft pasta, with the taste of the cheese coming through strongly. Previously had come the delicate flavours of a plate of rabbit tonno – the meat cooked and then soaked in olive oil, and served with a salad. My main course of lamb chops with ratatouille was followed by the old favourite I can seldom resist, more crèpes Suzette. (Allow 60 to 65 euros for 4 courses from the carte. A real snip on the wine list is the 2000 Tignanello for 48 euros. I doubt it can be found in a shop so cheaply. Silvio Cane brought it for me. And how pleased I was he did. This is a ravishing wine – nutty, sweet and dripping with over-ripe black fruit. Quite delicious. And my inexpensive white was good, too. Full-bodied, well-structured and silky, with layers of sherbet, this mixture of chardonnay and local grapes is produced 25 miles from Stresa (Carolus, Antichi Vigneti di Cantalupo, 2004 – 23 euros). Stresa has many joys to offer. And not least among them are the differing delights of dining at the Ristorante I Mori and at the Ristorante Charleston. Hotel Villa Aminta, Strada statale del Sempione 123, Stresa 28838, Italy. Regina Palace Hotel, Lungolago Umberto 1 33, Stresa 28838, Italy.